The reference in the logo is to shipping containers, one of the most important inventions of the 20th century. Actually, the word “invention” is not quite right: the idea of putting bulk goods into consistently-sized boxes goes back at least a few hundred years.2 What changed the world was the standardization of containers by a trucking magnate named Malcom McLean and Keith Tantlinger, his head engineer. Tantlinger developed much of the technology undergirding the intermodal container, especially its corner casting and Twistlock mechanism that allowed the containers to be stacked on ships, transported by trucks, and moved by crane. More importantly, Tantlinger convinced McLean to release the patented design for anyone to copy without license, knowing that the technology would only be valuable if it were deployed in every port and on every transport ship in the world. Tantlinger, to put it in software terms, open-sourced the design. Shipping containers really are a perfect metaphor for what Docker is building: standardized containers for applications. It doesn’t matter what is inside of a shipping container; the container itself will fit on any ship, truck, or crane in the world. Similarly, it doesn’t matter what app (and associated files, frameworks, dependencies, etc.) is inside of a docker container; the container will run on any Linux distribution and, more importantly, just about every cloud provider including AWS, Azure, Google Cloud Platform, Rackspace, etc. 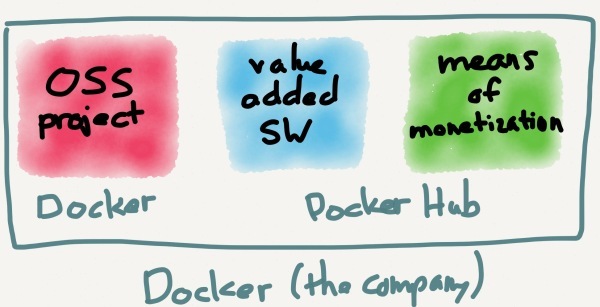 In short, Docker is a really big deal from a technical perspective. What excites me, though, is that the company is also innovating when it comes to their business model. The problem with monetizing open source is self-evident: if the software is freely available, what exactly is worth paying for? And, unlike media, you can’t exactly stick an advertisement next to some code! For many years the default answer has been to “be like Red Hat.” Red Hat is the creator and maintainer of the Red Hat Enterprise Linux (RHEL) distribution, which, like all Linux distributions, is freely available.4 Red Hat, however, makes money by offering support, training, a certification program, etc. for enterprises looking to use their software. It is very much a traditional enterprise model – make money on support! – just minus the up-front license fees. This sort of business is certainly still viable; Hortonworks is set to IPO with a similar model based on Hadoop, albeit at a much lower valuation than it received during its last VC round. That doesn’t surprise me: I don’t think this is a particularly great model from a business perspective. The problem with the “Red Hat” model is the complete separation of all three of these parts: Red Hat doesn’t control the core project (Linux), and their value-added software (RHEL) is free, leaving their money-making support program to stand alone. To the company’s credit they have pulled this model off, but I think a big reason is because utilizing Linux was so much more of a challenge back in the 90s.5 I highly doubt Red Hat could successfully build a similar business from scratch today. GitHub, the repository hosting service, is exploring what is to my mind a more compelling model. GitHub’s value-added software is a hosting service based on Git, an open-source project designed by Linux creator Linus Torvalds. Crucially, GitHub is seeking to monetize that hosting service directly, both through a SaaS model and through an on-premise enterprise offering6. This means that, in comparison to Red Hat, there is one less place to disintermediate GitHub: you can’t get their value-added software (for private projects – public is free) unless you’re willing to pay. Docker takes the GitHub model a step further: the company controls everything from the open source project itself to the value-added software (DockerHub) built on top of that, and, just last week, announced a monetization model that is very similar to GitHub’s enterprise offering. Presuming Docker continues its present momentum and finds success with this enterprise offering, they have the potential to be a fully integrated open source software company: project, value-added software, and monetization all rolled into one. Docker controls all the parts of their business: they are a fully integrated open source company. This is exciting, and, to be honest, a little scary. What is exciting is that very few movements have had such a profound effect as open source software, and not just on the tech industry. Open source products are responsible for end user products like this blog; more importantly, open source technologies have enabled exponentially more startups to get off the ground with minimal investment, vastly accelerating the rate of innovation and iteration in tech.7 The ongoing challenge for any open source project, though, is funding, and Docker’s business model is a potentially sustainable solution not just for Docker but for future open source technologies. We thought Docker would become a simple unit that we can all agree on. Unfortunately, a simple re-usable component is not how things are playing out. Docker now is building tools for launching cloud servers, systems for clustering, and a wide range of functions: building images, running images, uploading, downloading, and eventually even overlay networking, all compiled into one monolithic binary running primarily as root on your server. The standard container manifesto was removed. 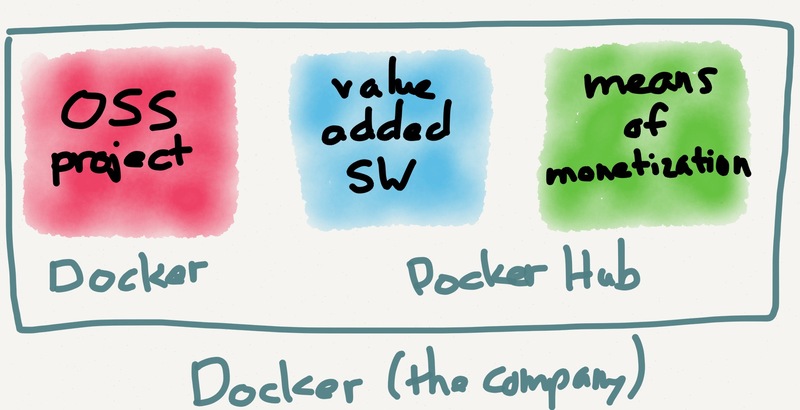 We should stop talking about Docker containers, and start talking about the Docker Platform. It is not becoming the simple composable building block we had envisioned. This, I suppose, is the beauty of open source: if you disagree, fork, which is essentially what CoreOS did, launching their own “Rocket” container.8 It also shows that Docker’s business model – and any business model that contains open source – will never be completely defensible: there will always be a disintermediation point. I suspect, though, that Rocket will fail and Docker’s momentum will continue: the logic of there being one true container is inexorable, and Docker has already built up quite a bit of infrastructure and – just maybe – a business model to make it sustainable. Next post: Podcast: Exponent Episode 028 – Squirrel!